The inviting light brown background with patterns in black, ivory and cochinel red, make for a welcome addition to any floor! 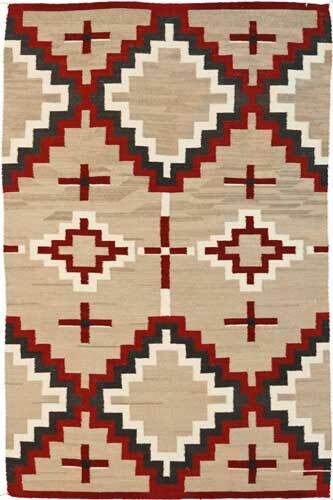 Warm, inviting, rugs inspired by Navajo weaving traditions and reproduced to have the literal feel, texture, weave and look of the Navajo hand-woven rug. New Zealand wool and color fast Swiss dyes, these rugs are sure to become treasures of the Sierra Madre! !